Telemachus: Why Are Liberals Considered 'Leftists' and Conservatives Considered 'Right-Wingers'? 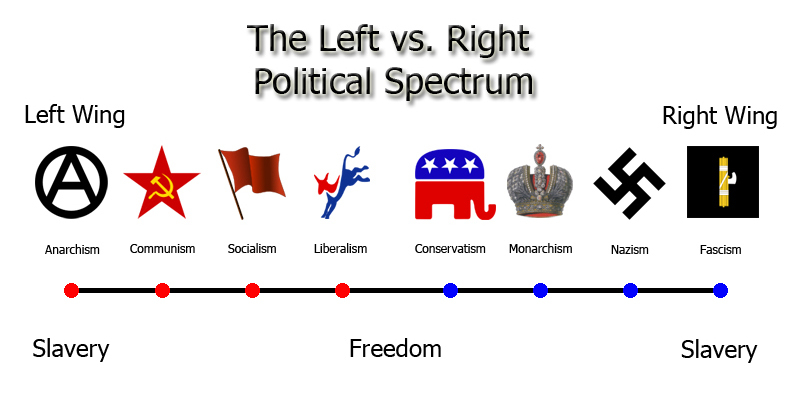 Why Are Liberals Considered 'Leftists' and Conservatives Considered 'Right-Wingers'? Doesn't it strike you as 'odd' how everyone seems to be calling everyone else certain names in the political world nowadays....but no one seems to know what they are or what these labels mean anymore? And here's the most basic of all ideological questions: Preserve the present order, or change it? At the French Assembly of 1789, the delegates who favored preservation sat on the right side of the chamber, while those who favored change sat on the left. Presumably after the French Revolution, all those who stood for 'conserving' the monarchial reign were guillotined while the ones who won the right to 'change it' got to do all the guillotining but that is another story for another time. We bet you think you are a 'true blue believer' in large, more compassionate government. Or you believe that the best government is that which governs the least as did Thomas Jefferson and James Madison. So you are either a 'rightie' who thinks you are always right on all the issues or a 'leftie' who thinks you are always right on all the issues as well. 'Are you for or against more government oversight into the sensitive personal areas of privacy and probity such as abortion, gay rights, illegal immigration or gun control? You see? We can see some people nodding: 'yes', yes', 'no', 'oh, heck no!' as they go through each line. Hardly anyone we have ever met has been for less government spending 100% across the board. Including tax breaks for corporations or targeted industries. Any time you cut taxes for one small part of the economy or society, that is 'just like spending more federal taxpayer money' on that program. 6 of one; half-dozen of the other as they say in the Joint Taxation Committee on Capitol Hill. 'Tax expenditures' they call them. We can't find anyone who is 100% for more government spending across-the-board either, truth be told. Liberals have a tough time swallowing more defense spending while conservatives choke on spending more for domestic programs. And since liberals as well as conservatives seem to have great difficulty proposing higher taxes to pay for their expansive use of the government till, there is no word in the federal budget vocabulary to make the analogous comparison that 'higher taxes are like less federal spending'. Think of higher tax revenues as the opposite of 'tax expenditures' in the budget. More like 'black holes of taxation'...they take in every tax dollar in sight and you really never see the impact of them ever again, do you? Same with liberals and conservatives on the social issues where they tend to flip-flop on their 'unlimited' versus 'limited' government intrusion views. The same liberals who want more federal involvement (spending) to help the poor also want less federal intrusion into what they consider completely private issues ranging from abortion decisions to gay marriage to smoking marijuana. The same conservatives who want less federal spending except in defense also say they want limited government except when it comes to setting norms and rules and regulations for society on the touchy social issues named above. So, what is it? Are you a big-government liberal or a small-government conservative? 100% of the time. 'Plus ça change, plus c'est la même chose' as the old French saying goes. 'The more it changes, the more it is the same thing'.